Pixable has been doing a pretty good job of helping iOS users sort through the myriad of media shared by friends across a range of online services. And now it’s officially launching on Android. Just to recap, Pixable has always sold itself as “your photo inbox”, surfacing the top photos and videos shared by your friends across the social sphere. It ranks and sorts your friends’ photos and videos based on popularity, with a view towards giving a more personalized viewing experience. We’ve covered Pixable on a number of occasions in the past, for example when the iPhone app rolled out video support, its iPad app got Instagram support, and then there was the Aviary integration. As for the the newly launched Android app, well, there’s a bit of a story behind it. The beta version of the app hit Google Play last month, developed by the winner of the Global Android Developer Challenge, Juan Carlos Viota – who happened to be a massive Pixable fan. Viota requested access to the company’s Application Programming Interface (API) and built an Android app within three weeks. It seems that the people at Pixable were so happy with it, they brought him on board and launched it as the official Pixable Android app. Having been in public beta for around six weeks now, the full release version of the app is launching on Google Play today. The app aggregates photos from Facebook, Instagram, Twitter, and Google Drive, though it omits YouTube which means there isn’t a separate video category feed as there is with the iOS app. Though it does still pull in videos if they’re shared in your normal social streams. We’re told that the reason for the YouTube omission was that they wanted to keep the product simple at its core, and focus on one thing – being a photo inbox. So it is more than likely that YouTube will be included in a later incarnation. 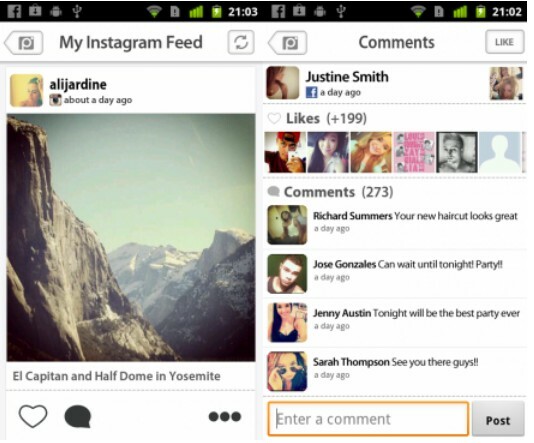 Moreover, users can like or comment on Instagram photos from within the app, and view and respond to comments on Facebook and Twitter photos too. Oh, and what’s with the Google Drive integration, you ask? Well, after connecting with your Google Drive account, you can also scroll through all your photos stored on the cloud-based storage service. Launched in New York in 2011, Pixable is backed by Menlo Ventures and Highland Capital Partners. 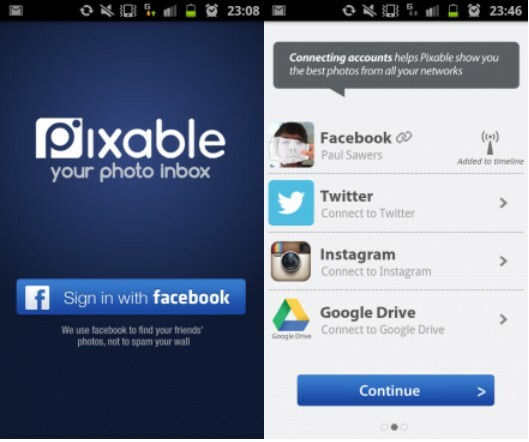 Prior to its Android launch, Pixable had reeled in more than 4 million users, with 2,000 photos swiped-through per-minute.